Rolls-Royce launched the Cullinan last year, and the seventh-generation Phantom the year before. So what's next for the ultra-luxe marque? A replacement for the current Ghost (pictured), and Autocar gives us a few details on what we can expect from Goodwood's next-generation "entry-level” limousine. Not the least of the advancements, we're told to expect, will be an adaptation of the aluminum architecture that underpins its new stablemates. That in and of itself promises to make the new Ghost much lighter and stiffer than the current model, despite the anticipated adoption of additional amenities and the Cullinan's all-wheel drive system. Though the Cullinan and Phantom launched a new 6.75-liter twin-turbo V12, Autocar expects the new Ghost to stick with the 6.6-liter version – albeit with likely upgrades. As it stands, the current version produces 563 horsepower in the current Ghost, 602 hp in the BMW M760Li, and as much as 624 hp in the Wraith. Rolls-Royce could try to squeeze out even more, or keep some in reserve for a more potent future Black Badge or V-Specification version. The new saloon could, however, port over the 48-volt electrical system from the Cullinan and Phantom to imbue it with mild-hybrid capabilities and an active suspension. Expect Goodwood to equip the new Ghost with every high-end and high-tech amenity it can fit into the big sedan – whether in standard or extended wheelbase form – in order to fend off the advancements of rival Bentley's forthcoming new Flying Spur, and the Maybach version of the Mercedes S-Class that's been coming at it from slightly down-market. 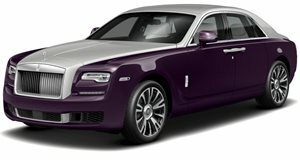 After the Ghost arrives (likely sometime next year), we can expect Rolls-Royce to similarly replace the Wraith fastback coupe and Dawn convertible with which the current sedan shares its underpinnings. But those will likely be another few years down the road.